How Much Damage Did The Wall Street Journal Just Do To Hedge Funds? Last week the WSJ published a story about hedge funders going to “ideas dinners” put on by research firms where they discussed various trade, including, but not only, shorting the euro.Of course, the paper dressed it up as scandalously as possible, cranking the cloak-and-dagger aspect of the story up to 11 on the dial. But there really is no scandal. 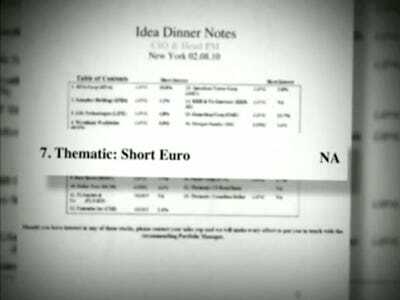 Hedge funds weren’t “conspiring” at these dinners, and what’s funny — as Blomberg revealed yesterday — at one of them, the whole shorting the euro thing was actually #7 on a list of ideas being discussed. So it wasn’t even the top trade idea. It wasn’t even in the top six! But the damage has been done, and now regulators on both sides of the Atlantic are looking into what’s going on when hedge funds unite to share ideas. As my colleague Vincent Fernando noted, the potential could be heightened restrictions on how analysts and hedge funds communicate (an issue that’s really been brewing since the Galleon bust). It’s the New York Times that’s been hammering Wall Street over and over again (especially on CDS-related issues), but even stories about Goldman shorting Greece while helping to disguise its debt haven’t had a huge impact in the media. This story has really captured folks’ attention, and it will probably do some harm.